I started blogging in 2011 and basically stumbled my way to where I am now. In the grand scheme of blogging I’m no one special. I don’t make enough to quit my job (yet 😉 ) but I am earning more than I spend. I think you can have a great blog without spending a lot of money on themes, hosting, classes etc. I also think that if you can afford to spend some money to make things easier you should! Over the years I’ve picked up a few tricks and services that make my blogging life easier and I’d love to pass that on to you. Some of these are affiliate links, some are not, but it’s all things that have helped me get to where I am right now. Might as well start off with the expensive one 😉 Billionaire Blog Club is a blogging course that teaches you how to have a successful blog. I really love the course, I think you can get something out of it no matter what level you are. Everything is video based so if you’re a visual learner you’ll find this really helpful. That’s really the only thing I don’t like about the course. I listen to a lot of podcasts and I don’t always have the time to sit and watch a video. If you hate video or you have a crappy internet connection it’s not for you. I wrote up a full review of The Billionaire Blog Club last time it was open so check that out if it sounds interesting to you. Even if you aren’t willing to shell out any cash sign up for the emails, they’re a huge help. Blogging in a creative niche without Pinterest just wouldn’t make sense. Tailwind is a Pinterest scheduler, you can set up a queue of pins to post at the optimal times. I manually pin to my own boards and schedule to group boards through tailwind. It keeps my pins going out without needing my input. Tailwind also tells you when you last pinned to a board, I try to repeat pins every month or so and keeping track of that is impossible with 350+ posts. Another feature of Tailwind that I rely on is Tribes. Tribes are themed groups that you add your pins to along with the other members. It’s a great way to find content for your own boards and it gets your posts out there too. Tribes can be hit or miss, some are awesome and others are basically dumping grounds where people leave pins and run. Tailwind even has a free plan you can use to try it out and see if it works for you. Mediavine is an ad network. In order to join you need to have 25k sessions per month. The RPM blows google Adsense out of the water. 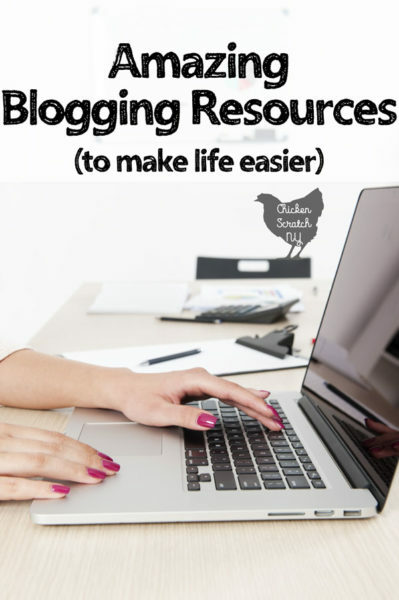 Since you’re reading a post about blog resources you’re probably aware that blogging costs really ad up. I’m at a point in my life where I need my blog to pay for itself. Joining Mediavine gave me the opportunity to put more into my blog, everything from services to craft supplies and even some extra income. It’s also more than just an ad network. There are a few Facebook groups and Tailwind Tribes for members. The staff is incredible, I’ve messed up my ads more than once and they’ve always helped me out asap. Affiliate programs pay a commission on sales, the Amazon affiliate program is one of the easiest to sell though. You can buy just about anything on Amazon. One of the best things about Amazon is that people don’t need to buy the item you recommend. Anything they buy after clicking your link earns you money. Your readers get what they want, you get some cash. It’s a win-win situation. The Hungry Jpeg is a graphic design resource store. You can buy graphics, images, fonts and more. Every month they have great bundle deals. I’ve bought several of them myself. I make money on my site so I need to commercial license for all of the fonts I use. Buying a bundle is a great way to get a lot of fonts for a low price. I’ve recently switched to using one font for all my branding but I like having lots of options to give my printables some pizzazz. I’ve recently upped my affiliate game (see Amazon above) and this plug-in has been a lifesaver. I have the pro-version. The best thing this plug in does is the auto-insert feature. I have so. many. old posts. Instead of going back through every single one I can just set it up to automatically link ‘hot glue gun’ to a hot glue gun on Amazon. I started using the plug-in in March and my affiliate income has been rising exponentially ever since. Don’t forget to PIN this to your Bloggin Resources board! What are some plug-ins, services or companies you can’t blog without? I’d love to hear them in the comments!